ScotlandsPeople have put the 1920 Valuation Rolls online. These are lists of properties, the rent or annual value, their owners, and occupiers and sometimes their occupation produced for the purposes of taxation. They include the first council houses in Scotland; the Logie Estate in Dundee and the first housing estate in Europe to have a communal heating system. The tenants included an architect, artists, clerks, a grain merchant, a jeweller, a journalist, managers, a surveyor, a telegraphist, a telephone engineer as well as many manual workers. Inheritance tax rose sharply in 1918, income tax also rose after 1918, as did the rates to help pay for local government and services, and these rolls show the new owners of properties sold by the landed gentry including the Duke of Sutherland to help meet the bills. More about the 1920 valuation rolls. Search the 1920 Valuation Rolls. If you didn't manage to ask your question on the ScotlandsPeople stall at our Family History Fair in Galashiels in May, there's another opportunity. ScotlandsPeople are offering free family history surgeries at Adam House, 3 Chambers Street, Edinburgh from 2pm to 4:30pm on Tuesday, 19th to Friday, 22nd November and 10am to 4pm on Saturday, 23rd November. No booking needed, just turn up. 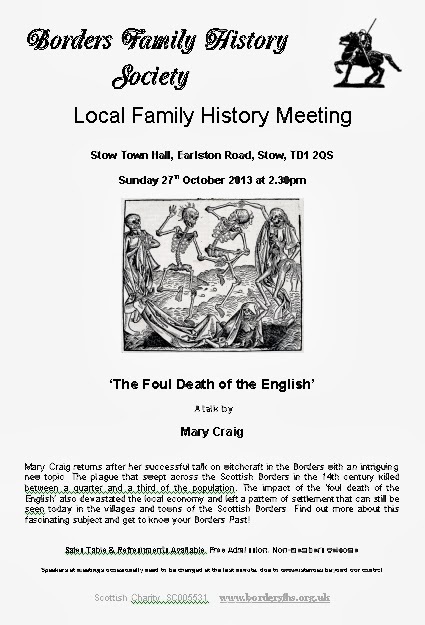 Our next public meeting is this Sunday, 27 October, at 2.30pm in Stow Town Hall, Earlston Road, Stow, TD1 2QS (see map) when Mary Craig will give a talk titled 'The Foul Death of the English'. No doubt you've heard of the Black Death. The plague that swept across the Scottish Borders in the 14th century killed between a quarter and a third of the population. More than that the 'foul death of the English' devastated the Borders economy and left a pattern of settlement that can still be seen today in the villages and towns of the Scottish Borders. Mary Craig, the well-known author and expert on the witchcraft trials of the Scottish Borders, gave us a dramatic and entertaining talk on witchcraft, two years ago. Don't miss this one ! I warmly invite you to attend the talk whether you are a member or not. Doors open at 2pm; the meeting begins at 2.30pm. We'll have a range of family history publications available to buy, and there’ll be light refreshments available after the talk (donation expected). It was an autumnal Sunday; the 15th September. The 258th day, of the 37th week, of 1771. At the bottom of the page was a faintly scrawled, Finis. It was the end for 23,712 days. Not until William Boag was married to Margaret Elliot, the eldest surviving daughter of Thomas Elliot, farmer, in Kirndean, Castleton, on the 17th August 1836, by the Rev. Angus Barton was the “Register of Marriages in Castleton Parish” reinstated. What happened that Sunday, in 1771, to the keeper of the Castleton marriage register: did he die, or walk away from his job on some principle, or are the subsequent registers simply lost ? It wasn’t from the lack of local ministers, in fact on the last page of 1771 entries, there are not one but two marriages for Castleton ministers, the Rev Robert Rutherford and the infamous Rev W James Fletcher. At this point I have to declare my interest, my grandmother was Hannah Jane Murray Elliot who herself was married in Newcastleton in 1913 and both her parents were Elliot also married in the village so the missing marriages are a real blight on genealogy research. For many years Thomas Elliot my great, great maternal grandfather living at 14 South Hermitage Street was the local grocer. Looking at dates and churches and ministers in Castleton between 1771 and 1836 for some reason why all these years marriages are missing I haven’t been able to come up with anything and it would be worth reading all the session records to see if any clues lie there. The villagers were certainly very active in church life, particularly the Secessionists who broke away and formed their own churches and the furore over the Rev James Fletcher who resigned over an accusation which amounted to heresy. In addition Henry Scott, the 3rd Duke of Buccleuch, moved the villagers to a new site in 1793, probably because where they were in the old village of Castleton was better for his sheep rather than “to found a hand loom weaving centre” but the facts of the move seem to be rather censored. A thriving church community; villagers deeply interested in the affairs of a number of churches, particularly for the size of the village. It’s hard to believe that marriage records weren’t kept from 1772-1835. I’m sure they were simply mislaid when one of the numerous church moves were made. The recommencement of entries in 1836 could be easier explained as the “Act for Marriages in England 1836” came into being. This legalised the concept of civil marriage into England & Wales from 1st January 1837. So this may have precipitated the restart although Newcastleton is in Scotland it’s on the border. Since the Marriage Act 1753, the only legally recognised marriages in England & Wales (with the exception of Jews & Quakers) were those performed in a parish church by a clergyman of the Church of England. This meant that Roman Catholics and members of other dissenting congregations, as also atheists, Muslims, Hindus or members of any other religious body, had to be married according to (the Anglican) rites and ceremonies which they did not support. So I make a plea to the local Border historians get this matter better known and get everybody to search the old lofts and churches and likely places. If they can come up with a lost Michelangelo anything is possible. This is a guest blog by Strath Stewart to celebrate Everybody Writes Day. 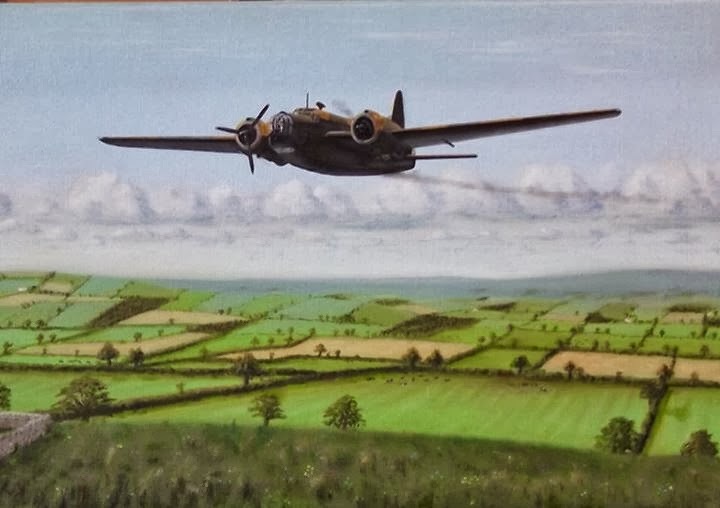 An interesting correspondence over the last few days with Brian Fare of the Melton Mowbray Wellington Bomber Memorial Appeal Fund. On 13th. 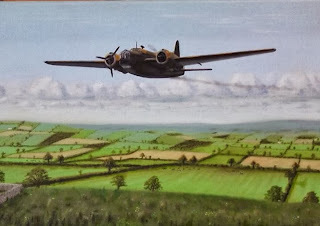 August 1944 a Wellington Bomber LN281 crashed over the Town killing seven of the eight crewmen and it is proposed to erect a memorial to the crew next August which will be the 70th. anniversary of the event. It is hoped that relatives of the crew will be able to attend the unveiling and it is also hoped that some might hold information such as letters or photographs which can be made available. Among the seven who lost their lives was Sgt. Robert McCudden of Kilncroft, Selkirk. Robert, born in 1925 and was the son of Alexander and Christina McCudden. He is buried in Shawpark Cemetery. Brian would be delighted to hear from anyone connected to the family or who can provide any information. Everybody Writes Day was a four-year writing project partnership between Booktrust and the National Literacy Trust, originally funded by the Department for Education, whose funding ended in 2011. It was aimed at stimulating pupils in primary and secondary schools to become more interested in writing not just across the curriculum but outside the classroom too. There are a lot of resources for schools. Many of those pupils will now have left school. The word 'everybody' includes pre-school and adults too, so quite why the Booktrust, Scottish Book Trust and the National Literacy Trust haven't sought to be more inclusive mystifies me. Perhaps they would say that because it's not being funded they can't afford to be more inclusive. They should be encouraging everybody to write for Everybody Writes Day on 21st October. Therefore, let's hijack Everybody Writes Day from those unimaginative organisations and declare that it's for everyone ! Perhaps you've got a family history story that you would like to share or a brick wall or a puzzle that's preventing you getting further. To celebrate Everybody Writes Day, we're offering you the opportunity to put it on the blog - don't worry if you can't think of a title, we'll add that if necessary and sort out the labels. Either reply to this in the comments or send a message on our Contacts page using the contact type Contact the Webmaster.